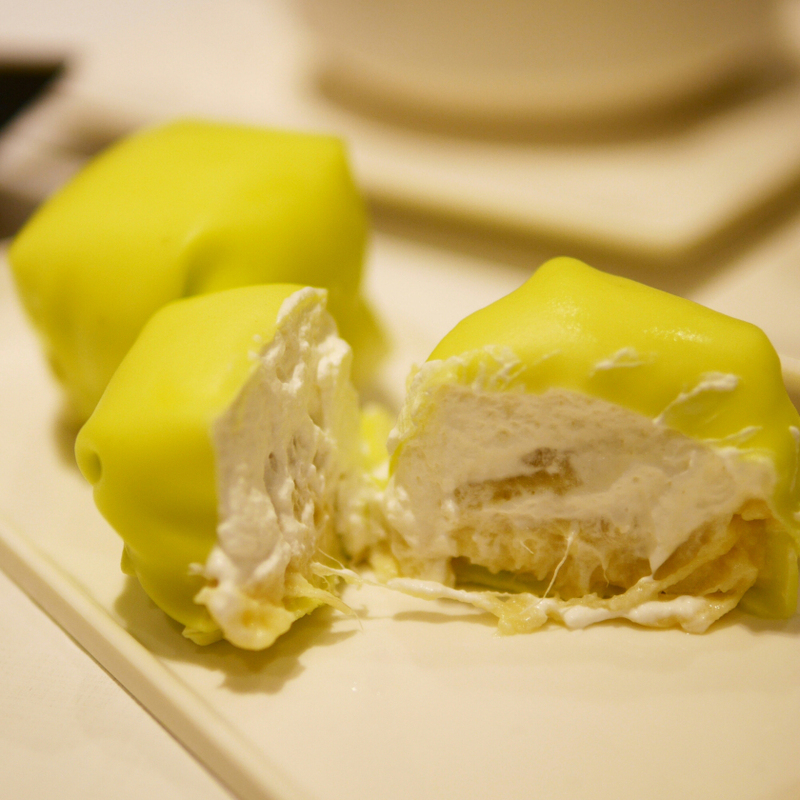 Here are some of the best Hong Kong-style desserts for durian lovers. Though most commonly found in Southeast Asia (Thailand and Malaysia), durian has amassed a large fan base here in Hong Kong. In fact, bringing home a durian (packed and sealed to contain the stinky smell) on a flight back from vacation is pretty common for the average durian-loving Hong Kong-er. Durian can be expensive to buy, especially when it’s not in season (winter). A pack with two pieces of the top notch “Musang durian” in a supermarket could cost about HK$400! So having durian desserts is definitely a more mainstream way to satisfy such craving. 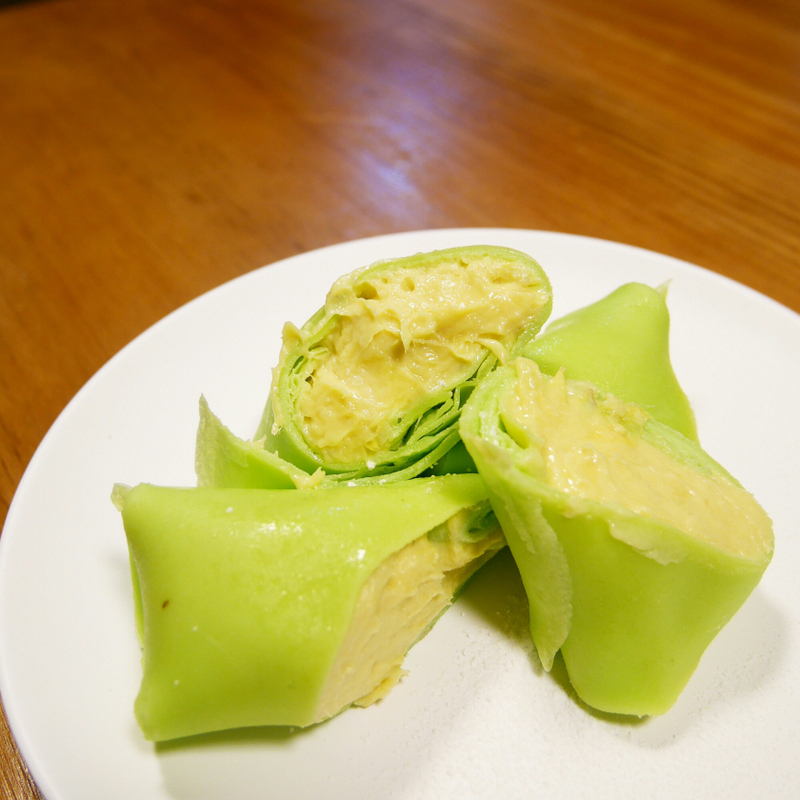 Here are my favourite local Hong Kong dessert cafes, which offer some of the best durian desserts. Durian queen 榴槤女王 from Golden Hall 金滿堂甜品 in Kowloon City, Hong Kong. The absolute orgasmic combination of durian in a dessert has to be the “Durian Queen” (榴槤女王). It was innovated in this store and the first bite is absolutely mind blowing, even after more than 20 visits in the past year! Durian queen is a coconut milk pudding with coconut milk sauce. 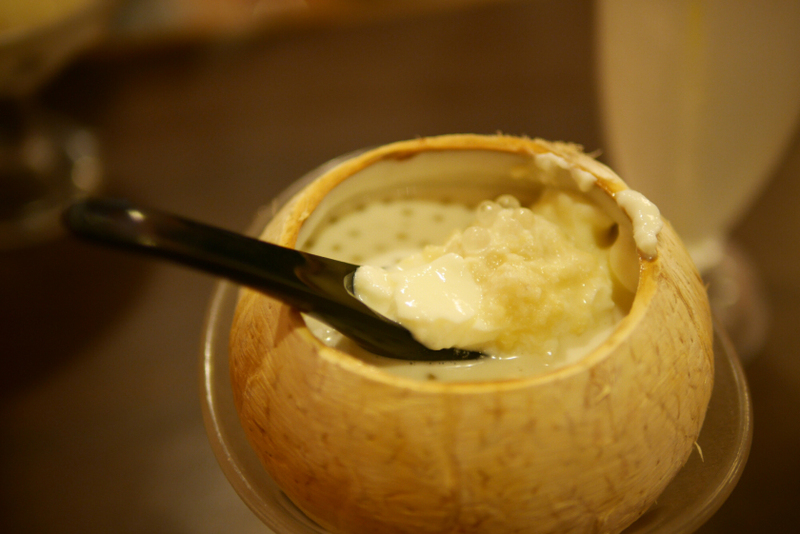 A slab of durian is placed inside and the fruit taste transfuses into the coconut milk. The combination is just divine. However, in winter they use frozen mashed up durian instead of a fresh piece – which does detract from its overall score. Have it in the summer for the real deal. Mango mochi from Golden Hall 金滿堂甜品 in Kowloon City, Hong Kong. As a side note, they make the best mango mochi I’ve ever had. It’s a small portion and easy to share, so you can order it as a side to your durian madness. The queue outside this dessert cafe is INSANE, especially on weekends. Sadly, that just tells us how good the desserts are here and made me ever-more curious to wait and try. Durian is not necessarily their selling point, as they serve wide variety of traditional Hong Kong desserts which, from my sampling, were very good (I’d say much better than the now-mainstream Honeymoon dessert – featured below). One of their durian stars is this durian ice cream x Thai glutinous ricecombination (榴槤黑羅米). Both ice cream and purple Thai sticky rice are made very well, though the durian taste is not super strong. Now this is a truly dedicated durian store. All their desserts feature Musang durian, the most smelly and expensive of them all. I’ve sampled a large range of their offerings and the durian ice cream soft serve is by far the winner. Another item worth trying is the durian pancake, which is a hot pancake with durian fruit inside. 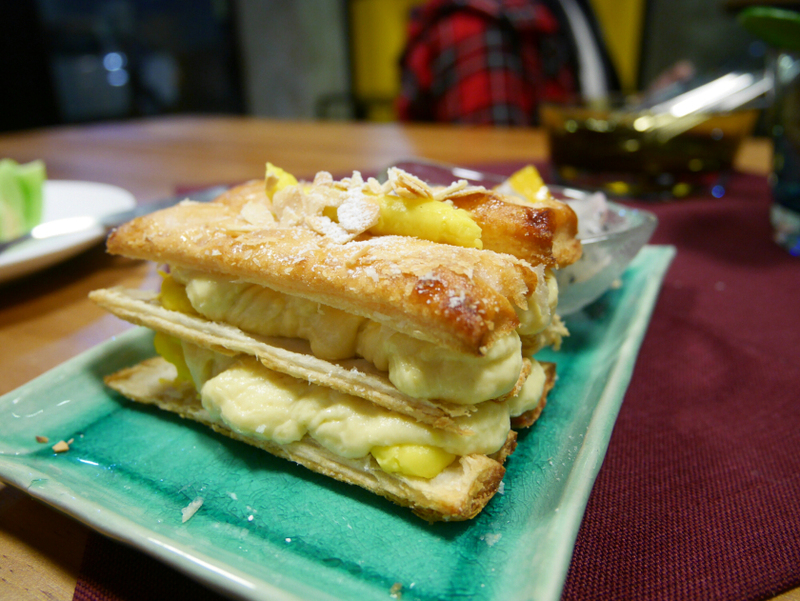 Durian napoleon at Musang durian in Causeway bay. However, the durian mochi and napoleon were both let downs. The napoleon in particular had a strong sour-y taste (not from the durian) which meant the combo did not really integrate well together. They don’t really serve non-durian items here, so you really need to buddy up with a durian lover to come here. 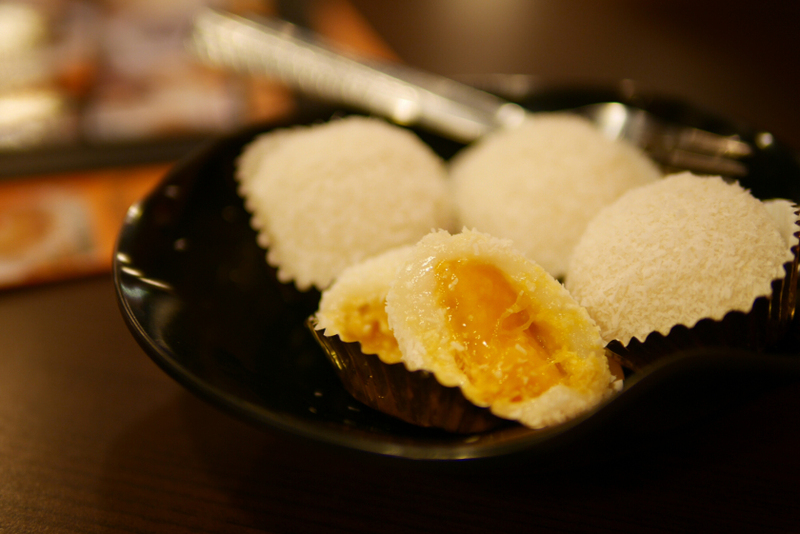 Honeymoon desserts has a long history and actually originated from the remote countryside of Hong Kong, in Sai Kung. Now it’s flooded across the whole of Hong Kong and even other Asian countries! Although quality maintenance and consistency on some products have had some troughs in recent years, I have to admit that has improved more recently and desserts here are overall, always a safe bet. Their durian pancake is an absolute winner, still better than Cong Sao’s. 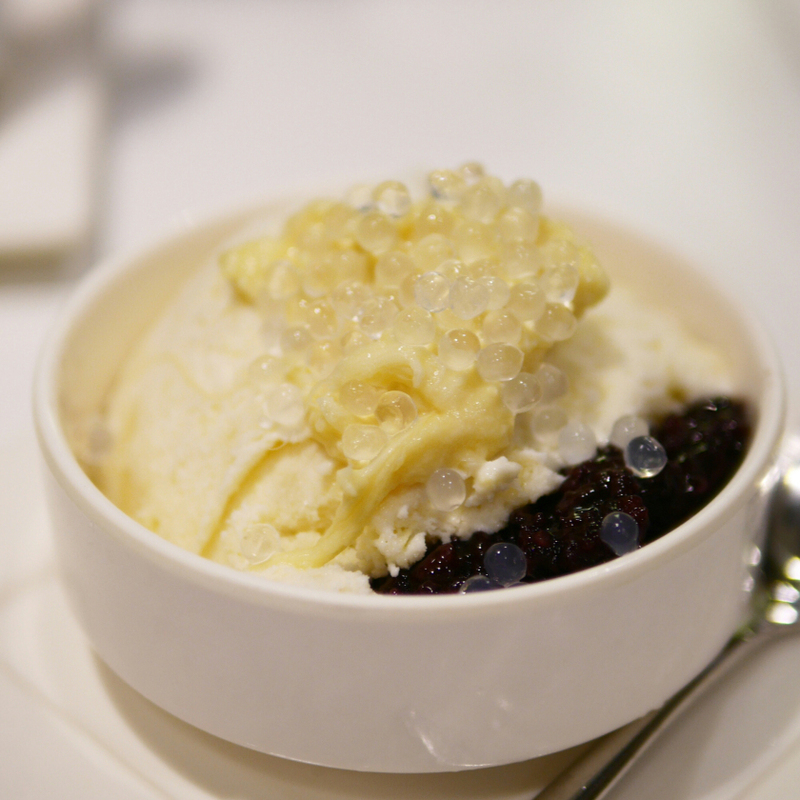 The other dessert I love to order here is their durian x glutinous rice x icy coconut milk sauce (榴槤忙返 pictured above) . The combination is great, though Cong Sao’s sticky rice is made much better! Be sure to try out Golden Hall or Cong Sao! The durian scene has really been revving up lately. But Honeymoon dessert is still my old school convenient go-to option. Golden Hall and Cong Sao are my favourite; they’re a bit out-of-the-way, but those two do great durian dishes and local Hong Kong desserts in general too! Food blogger - bringing you foodporn and ideas for dining in and out. Check out lolleroll.com!